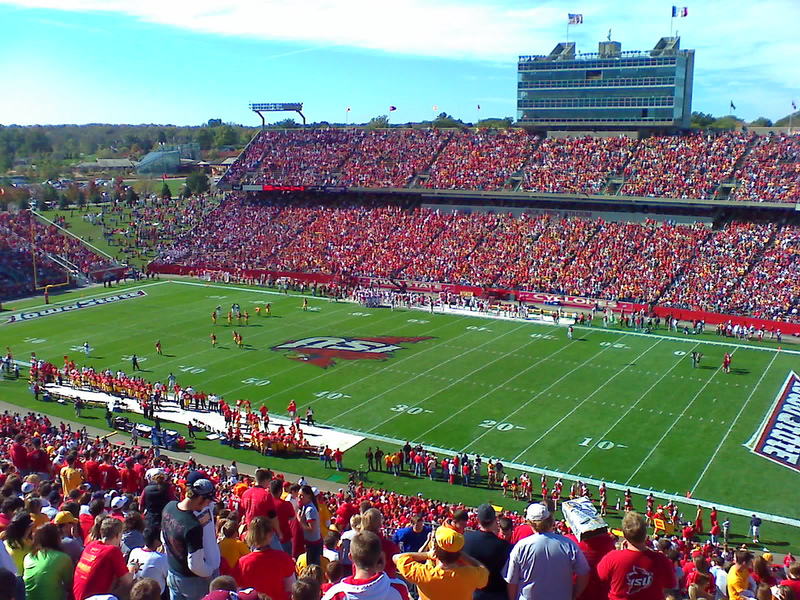 Trice Stadium, home of the Iowa State Cyclones, is one of the smallest stadiums in the Big 12 Conference. Before moving into Trice Stadium, the Cyclones played at Clyde Williams Field. The team had played at this stadium since 1914 and by the 1970s it was time a new stadium was built. Former Athletic Director Lou McCullough led the way it getting a stadium constructed. In October 1973, construction on Trice Stadium began and was completed two years later. Named in honor of Jack Trice, Iowa’s first black athlete who died due to injuries sustained during his first game, the Cyclones played the first game at Trice Stadium on September 20, 1975. The stadium consisted of two tier grandstands on both sides of the gridiron and had a seating capacity of 42,500. <align=”left”> Over the years, Trice Stadium has seen several improvements and expansions. In 1976, bleachers were added in the end zone increasing the capacity to 48,000. A new state of the art scoreboard was added in the south end zone before the start of the 1994 season. The Jacobson Athletic Facility, housing locker rooms was built in 1995. With the completion of this facility some areas of seating were removed decreasing the seating capacity to 43,000. Also prior to the 1995 season, the Astroturf playing field that had been at the stadium since it opened was removed and replaced with natural grass. In 1997 a new three story press box was constructed containing nine luxury suites. Fourteen luxury suites were built in the old press box and 480 club seats can be found on the east side of the stadium. After the 2007 season 23 luxury suites were added on the west side of the stadium. This renovation project also included widening the concourses on the west side, increasing the number of restrooms and concessions, and renovating the club level on the east side of Trice Stadium. In May 2008 the university approved a $55 million expansion that replaced and expanded the south endzone including adding an upper deck. This project also upgraded the east concourse to include updated restrooms and concession areas. In May 2014 Iowa State unveiled its south end zone project at Jack Trice Stadium. This project, completed by the 2015 season, enclosed the south endzone with permanent upper and lower seating. It increased the seating capacity to 61,000 and includes a new 150 feet by 36 feet videoboard and sound system.